Last fall we debated what to do with our car and its elderly age. We decided to leave it till spring. Its a 2001 Toyota Sienna and has over 260,000 km's on the engine. It's been a totally reliable car, no major issues, good on gas and room for the stuff and dog kennel we travel with. The car started making noises late fall and earlier this month it started a front end wobble so we suspected the wheel bearings. The trouble is, the repair would cost more than the vehicle is worth and we'd still have an older car with other expensive issues starting. We were grateful it lasted the winter months at the least! So Bruce started looking around at our options. We had to have a similar seat height arrangement due to my joint issues (my hips can not be lower than the knees so many sedans are out). We need room for Calli and that means a kennel. She is not a "just jump in the back" kind of dog. She gets all silly and wants to climb around, bark at other cars and stuff going by. No, she goes in a kennel and it also keeps all the associated dog mess in one spot too. Here she is with her fresh new spring hair cut. Don't let that innocent look fool you! 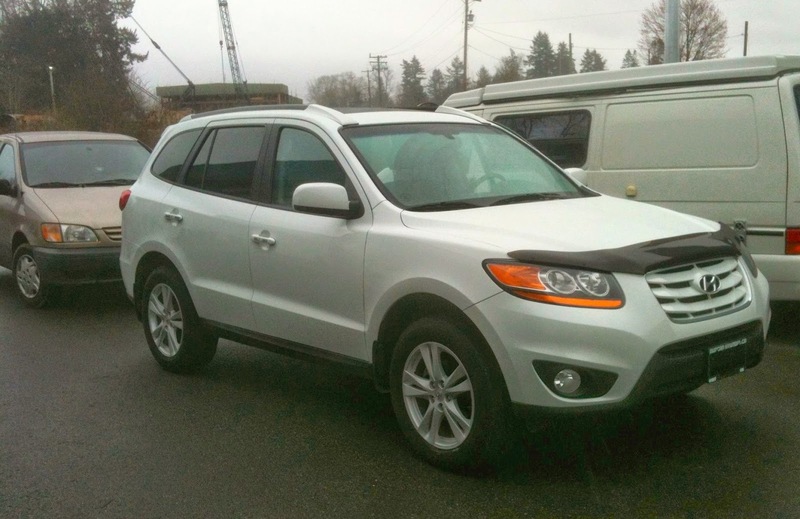 A 2010 Hyundai Santa Fe LE, with low mileage, just brought in as a trade in the day before. On the 19th, it was ours! That's our old Sienna in behind the new vehicle. The Santa Fe is higher and although narrower than the Sienna, its roomier inside. Its very nice to drive too. So no more over heated me when we drive to the Okanagan. We have AC again now. So pardon my excitement at a new car. It doesn't happen around here very often and the last time was fourteen years ago. We literally wore the last one out. She was destined to be recycled for parts as there was no value to selling her again. Sad huh? I must admit that it feels good to have a new ride. We signed the papers on my birthday and Bruce tried to say it was my birthday present, but I straightened him out on that point! After wading through all this personal stuff, if you are still with me, you deserve some weaving content now! In my last post you read all about the slow start to this current silk shawl project. The beaming was an education in patience for both myself and my helper Bruce. The warp was planned for two shawls and to economize on warp, I laced it on and got under way using the two stick method. I used a fine 55% silk / 45% yak blend that I purchased from Treenway Silks when they were still on Saltspring Island. Its a lovely soft grey beige and works so nicely with other colours. 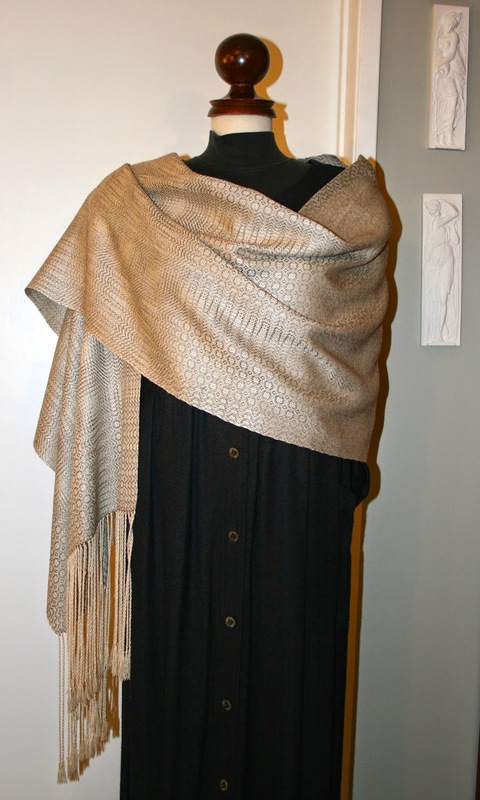 The tussah is a mellow gold tone and the two looked great together. This project cleaned me out so I did place an order for more silk yak blend from the new Treenway. Great service and quick delivery. Gentle hand wash in warm sudsy water, with a steady squeezing to help threads to shift about. Three ends per dent can give you some reed marks for the first wash or two. Two rinse water changes and much squeezing. I hung it over a rod to dry overnight. Then my gut told me to go back and give it a pressing while still damp to remove crease lines! I'm glad I did as the next day, I gave it a hard pressing and it was smooth, smooth, smooth! Any lines or creases can seem to sett if left to dry first. It measures nineteen inches by eighty inches plus a six inch fringe. I lost an inch in width and four inches in length *more* than I had planned on for shrinkage! The tussah silk wasn't finished being annoying it seems. I have made notes in my records to allow greater shrinkage than 10%, and also about the cling problem! I still have some left for future projects, so forewarned is best! Bruce says that from a distance it looks a bit like snake skin. 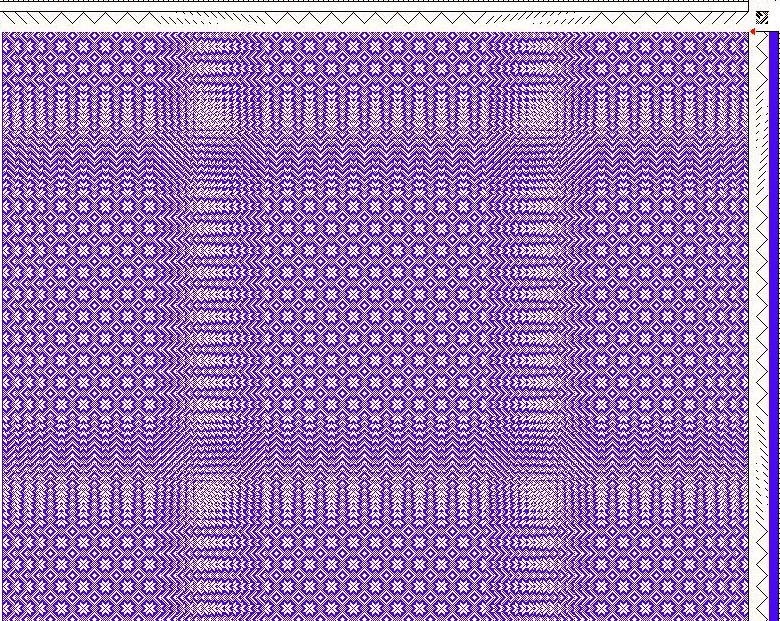 There are shifting patterns all over it so it plays with the eye! Its light and neutral in tone, but the pattern is definitely there but not overpowering. Its going into the Etsy store and so we'll see what happens from there. The second shawl is underway....and it will be a slow time of it again. Made some changes to my treadling plan and also my weft yarn. I'm using hand dyed silk / cotton blend in a plum tone, also from Treenway Silks from my stash. I hope you are all enjoying the extra daylight and looking forward to more spring-like weather.... and for those of you with snowbanks and blizzards, want to buy our property on Vancouver Island? Well, the snow is gone... melted away in the rain and the early spring flowers are making an effort to resume growing. We have crocus and snowdrops. The greenest things in the garden are the weeds of course. I've seen hummingbirds, swans and geese all back at the Somenos Marsh. I think I even saw a red wing black bird today as well. For my readers stuck in snow drifts, take heart... Spring is coming for you too! I saw my surgeon this past Monday and its now official that my left knee replacement will be first up and right hip will be second some months later. So the knee surgery will be approximately late summer or fall. Now if my knee can hold out for some treadling until then, I'll be a happy camper! We took a couple of days to go and visit my Dad who is *still* in hospital. That's three months in there for him now but he does seem to be slowly making small improvements now. We had an upfront view of things on the return trip! This is a view up a cloudy Howe Sound from Horseshoe Bay. We're cosy and warm in the car and the ferry turned left soon after this was taken and headed across the Strait to the Island. Another change for me is a new computer and I have been learning the ropes for a new operating system on my new Mac Air. Its amazingly thin and light weight on the lap, which is good for my cranky knee. No moving parts and so no overheating issues too. While I still have alot to learn, I am enjoying the change! I bought a visual guide book to assist me. I still have my old Dell laptop for the PC stuff and a ton of my pictures stored there! So this blog post is a joint venture between Apple and Dell. I'm happy they 'hand-shake' well! I have my priorities straight as the first program loaded was Fiberworks- PCW! I have a new manual to read up on that too now... A big thank you to Bob at Fiberworks for his help! There has been some weaving going on here. 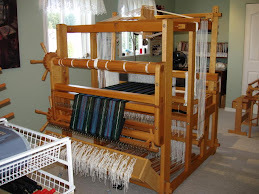 The Woolhouse Tools loom is all dressed up with my odds and ends coloured 8/2 cotton towels as shown in the last blog post. The loom has now been additionally advertised up and down the Island, Sunshine Coast and Vancouver and Kelowna area now. Meanwhile on the Louet Spring.... is Italian Silk (from Diane Sanderson's Silk Weaving Studio) in a soft gold for two shawls. I bought it a few years ago when we were there visiting on Granville Island. I'm using a 12 shaft 12 treadle draft sent to me by Gudrun. Looks nice here doesn't it? Well, trust me, its nothing but trouble just waiting to happen! I set it up on the back beam and placed the ends into the built in raddle, sett for 36 epi. I enlisted Bruce's help with winding on and its just as well I did. We had a nice long afternoon together "inch-worming" the warp on.... literally inch by inch! The fuzzies on this silk grabbed onto each other. I call it halo'ing. Bruce had to maintain tension and clear the raddle slots and I wound for an inch or two and then used a needle to work apart the warp ends, then pick off fuzzies for all eight yards of this warp! We had a great chat, sang some songs and had more than a few laughs along the way! Here I am... picking away! So finally I got the weaving under way and here's the first edge of the first shawl. The weft is a silk yak blend in a beautiful silvery beige. Its the equivalent of a 30/2 for size and weight. I will go into more detail in my next post on draft and project details. I plan to cut off the first shawl and finish it while weaving the second. I'm trying a special effect with the treadling plan and hopefully it will turn out as I planned. This will be my last full twelve shaft draft and twelve treadle until after my surgery is done and I'm stronger again. The weight of the shafts and treadles is too much for me now. So there will be more eight shaft projects﻿ (and perhaps even less?) in the near future while the knee holds out.... or is that hold on?